AIEA, Hawaii, April 12, 2018 /PRNewswire/ — Bubbies Homemade Ice Cream & Desserts and its new Triple Chocolate Mochi Ice Cream has won a prestigious 2018 sofi (specialty outstanding food innovation) Award” from the Specialty Food Association which recognizes outstanding consumer food products. 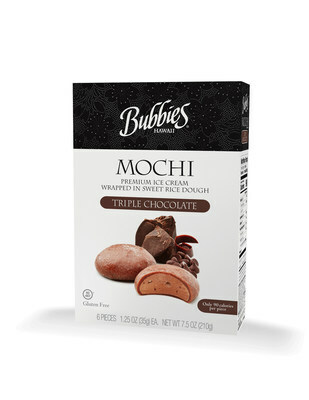 Bubbies Triple Chocolate Mochi Ice Cream was one of more than 2,600 “sofi Award” entries this year and was named the New Product Winner in the Ice Cream, Gelato, Frozen Treat category. The New York-based Specialty Foods Association is the leading trade organization following the $127 billion specialty food industry. Established in 1952, the Association is known worldwide for its Fancy Food Shows, sofi Awards, and its monitoring of the international food scene. The not-for-profit Specialty Food Association has more than 3,500 members including manufacturers, importers and allied professionals in the U.S. and abroad. Bubbies Triple Chocolate Mochi Ice Cream is a decadent blend of sweet, smooth chocolate ice cream with premium chocolate chips wrapped in chewy and delicate chocolate mochi. Amazingly, Triple Chocolate Mochi Ice Cream has only 90 calories per serving.